Transworld graciously allowed me to share the interviews and pictures that I drew from on my humble blog. Here is part three, industry old-timer and all-rounder Akasha Weisgarber, founder of Hightide Mfg, edited sparingly for spelling and clarity. 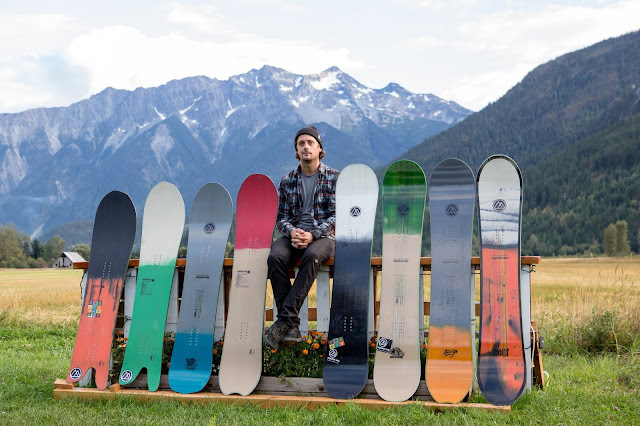 Akasha: It's a small snowboard company that is designed, tested and handmade with machines in the mountains of British Columbia, Canada. It is owned by three BC snowboarders who have lived the lifestyle for decades, Gabe Langlois, Tyeson Carmody and myself. Every board is shaped and built by me with a focus on mountain snowboarding. I've wanted to shape and build snowboards for a long time as I've always had a renewing vision of what my perfect board would look like. Eventually I ended up going back to school for architectural technology that taught me how to use computer-aided design software which allowed me the skills to shape snowboards down to the micro millimetre. With the help from some industry friends - Johnny Quattro, Alex Warburton and Sean Johnson - I started to shape and draft boards on the computer for a few different snowboard companies. With so many other shapes in my head and no outlet to bring them to life I brought up the idea of building snowboards to Gabe one night and he was down to help make it a reality. We built a two ton pneumatic heat press from scratch and I started to press some prototypes back in the winter of 2013-14. Even the first blank prototypes rode really well and the mayor of Whistler, Rube Goldberg started riding them. Then Tyeson jumped on the first Hippy Slasher proto and liked it so much for the deep Kootenay pow that he refused to give it back so Gabe asked if he'd like to join the cause. 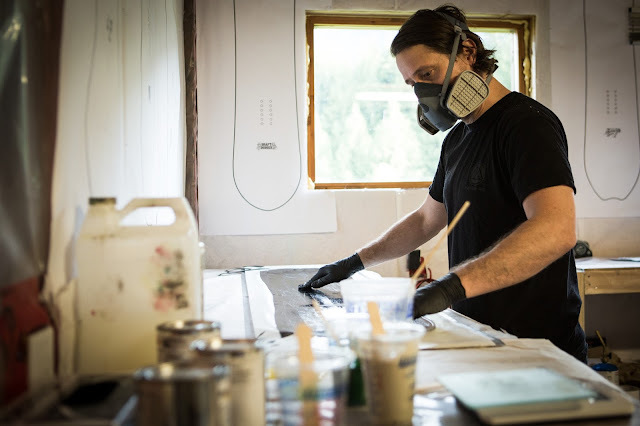 We weren't exactly planning on starting a snowboard company, we definitely didn't have a business plan, more of a desire to build boards to ride and Hightide Mfg evolved from that. I like to think of it as an evolution of a lifestyle. What separates Hightide from other brands on the market? The board shapes and how they ride. The craftsmanship and the unique resin tint topsheet colors. I don't know, however you perceive it to be different from other brands. We're just trying to have fun with it and do our own little thing in the saturated snowboard market. Mostly from time spent snowboarding in the mountains of British Columbia. Growing up living the snowboard lifestyle in Whistler for decades with thousands of days spent on snow brings a lot of experience to draw inspiration from. Riding so many different boards over the decades I've learnt to understand the minute details in snowboard design that I believe make boards ride really good. Of course I also keep up to speed with the snowboard and surf industries as there's a lot of progressive board shaping happening especially in the last five years or so to draw inspiration from. Pure and simple enjoyment. Snowboarding is so enjoyable that it has been the biggest driving force in my life since the first day sliding sideways. Riding with friends, powder days, adventure, the snowboard community and being outside in the mountains and feeling connected to nature all intertwine to make it a highly enjoyable lifestyle. Where and how are your boards made? Is it really a little shop in BC like the video on your site? I build and press all of our boards in a small shop on Gabe's property in Pemberton, BC. The board materials are sourced internationally for the highest quality components and the cores and base material are CNC machined to a tenth of a millimetre tolerance to my CAD files by a couple outsourced companies as those machines are too expensive to own at our current production volume. The boards are stone ground and pro tuned on the best machines by our friend Adam Levitt at a local shop in Whistler. Hopefully we will have all these very expensive machines in house one day as we grow. Bane brings a board into existence. They can be purchased at www.hightidemfg.com with shipping to many countries and at Showcase Snowboards in Whistler, BC. If you are in Whistler you can arrange to try a demo board for a day or two by emailing info@hightidemfg.com. We will also be doing some on hill demo days this winter mainly in British Columbia. What do you see in the future for Hightide? Being focused on flexible manufacturing to be able to prototype and produce boards at low volumes so that new board shapes can be put to market often. Coming up with new shapes and testing them out is the fun and creative part so look for new shapes in the future. That and working to grow the brand to maintain the company and lifestyle. What else would you like people to know about Hightide? The name comes from us saying it's "lowtide" in the early season meaning there's not much snow. We don't really say it's "hightide" when there's lots of snow but that's what it means. That or maybe we were just high? ha. Anyway who doesn't want a hightide (powder) day.